This Wookiee roars! A legendary Wookiee warrior and Han Solo's copilot, Chewbacca has a big heart and is unwavering in his loyalty to his friends. Imagine epic adventures as travelling across the galaxy battling the Empire in the cockpit of the legendary Millennium Falcon with this Star Wars Forces of Destiny Roaring Chewbacca adventure figure. 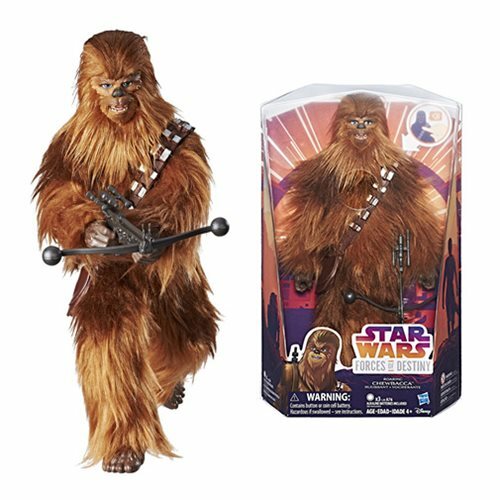 This highly poseable Chewie figure lets out a mighty roar when his chest is pressed, and features realistic Wookiee fur. Re-create the battles and stories of Star Wars with this true-to-entertainment figure! Includes: Adventure figure, bowcaster, bandolier, and instructions. 11-inches tall. Ages 4 and up.